Mead’s alcohol content can range drastically from one mead recipe to the next and between mead makers. What is the Typical Mead Alcohol Content? Here at Hidden Legend, our mead alcohol content is 12.5% by volume in all of our still meads and 8% in our Bearded Saint Carbonated Mead line. The mead alcohol content of 12.5 if very comparable to the alcohol content of a lot of grape wines. Mead is sometimes called honey wine. Honey wine is actually the current designation given to mead alcohol by the United States Government. Mead is honey wine because it is made by fermenting raw sugars like would be done in grape wine making. 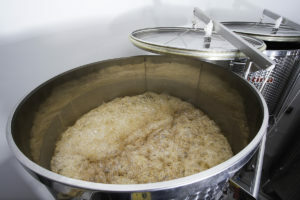 Mead alcohol is not brewed as is the often used description for making mead because the sugars are not converted by brewing during the mead alcohol making process. If you have any questions about our mead alcohol content, ingredients or any other product related inquires, contact us.